As the feud between Amazon founder, Washington Post-owner and world's richest man (at least until his divorce is finalized) Jeff Bezos and National Enquirer publisher AMI intensifies following Bezos's decision to publicly expose the tabloid's alleged attempt to blackmail him into dropping an investigation (and retracting allegations of political bias), another billionaire-backed media organization has shed some more insight into why AMI has pursued Bezos so aggressively. In a report published Tuesday, Bloomberg revealed that AMI, the privately-owned publisher of the Equirer, is deeply in debt after a spree of acquisitions and several difficult years. Documents reportedly reviewed by BBG showed the tabloid had recorded a $31.5 million loss in the six months that ended Sept. 30. As of the beginning of October, AMI owed $203 million more than its assets were worth after racking up more than $250 million in losses over the last 5.5 fiscal years. To put that in context, Amazon's advance from Monday's session inflated Bezos' net worth by more than AMI's revenue for the first half of the fiscal year. Though it is never outright stated in the story, the implication in clear. 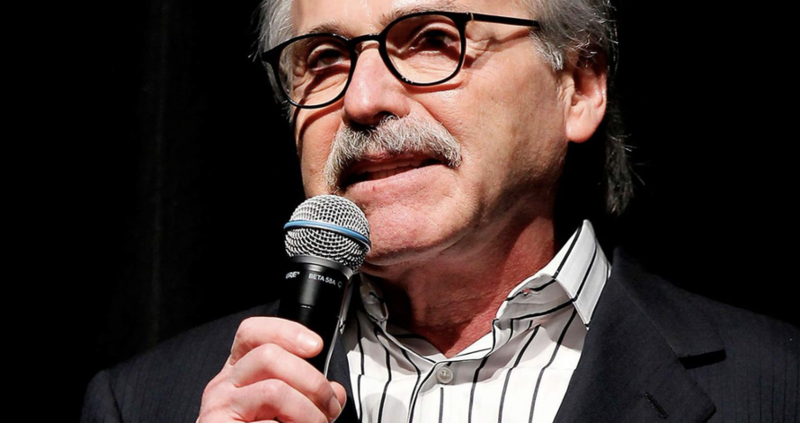 AMI owner David Pecker, struggling to keep his publication afloat, has made some kind of devil's bargain with the Saudis, and has in turn agreed to do their bidding in going after Bezos, whose Washington Post had employed murdered Saudi dissident journalist Jamal Khashoggi during the months before his death. Though, on paper at least, the Saudis don't own any equity in the company, nor any of its debt - at least not directly. Though recently "several new investors" have "come into the fold," according to a company insider. Though on paper, the majority owner is New Jersey based Chatham Asset Management, which owns 80% of the company after throwing CEO David Pecker a lifeline in 2014, and Leon Cooperman, who owns a not insignificant 7% stake. In recent years, AMI has courted Saudi Arabia to help buttress its finances. It also published a nearly 100-page, ad-free glossy magazine heralding the U.S. visit by Saudi Crown Prince Mohammed bin Salman. The move prompted the company to ask the Justice Department whether it needed to register as a foreign agent, the Wall Street Journal reported. And though a series of acquisitions and sales have muddied the waters, BBG was able to suss out one salient detail: AMI is not a profitable enterprise. The media company’s losses in recent years helped fuel its growing pile of debt. So did more than $181 million spent on acquiring publications, such as Us Weekly. But while losses have narrowed - the company reported a $45.1 million deficit in last year’s first half - the improvement is attributable to a one-time $19 million gain from the sale of a magazine in 2015 that the company recorded in the quarter ended Sept. 30. At the end of last year, AMI's parent company issued more than $300 million in zero-coupon debt. Though there have been improvements in its operating income recently, right now, the company seems poorly positioned to take on Bezos, a man whose resources are virtually unlimited. At the end of last year, the company’s parent, Worldwide Media Services, issued an additional $300.6 million in zero-yielding debt, which results when debtors promise to repay their creditors substantially more than they borrowed, bringing the total to $869 million. AMI borrowed an additional $460 million from lenders and bondholders through the start of January, about half of which is costing the company 10.5 percent in interest. There have been improvements. During the first half of its current fiscal year, its operating income, which excludes items such as its borrowing costs, jumped from last year’s $5,000 loss to a $611,000 gain. AMI’s buying spree also established it as the nation’s leading purveyor of celebrity magazines. Its journalism has drawn White House praise as well: Trump said last month that the National Enquirer produced “far more accurate” news stories than the Bezos-owned Washington Post. All of this should shed some insight into why Bezos decided to go public with the blackmail story: Particularly after damaging its relationship with the White House after agreeing to cooperate in the Mueller probe, AMI is in a weakened position. Which begs the question why it decided to go after Bezos in the first place. Was it merely to sell a few more issues? Or is there something more to this story?